Regional Rear Commodore for Ireland Alex Blackwell organised the first OCC social event in Ireland in several years. 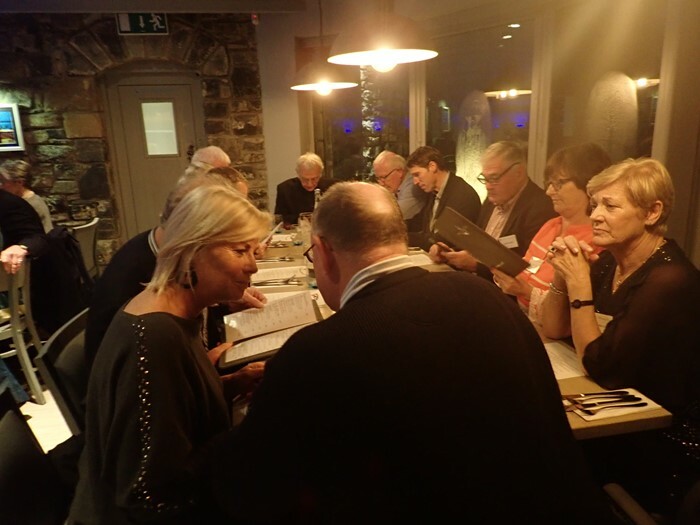 Held in the lovely town of Westport, the group convened in the Towers Restaurant on the Quay overlooking Clew Bay. People arrived from Northern Ireland and all points south in the Republic, many taking the opportunity to spend several days in the breathtaking region over the bank holiday weekend. That Westival, the Arts Festival, was underway was a decided bonus. Among the attendees was Carrickfergus Port Officer and first winner of the Barton Cup, Wendy (Moore) Grant. Other members who made the trip included Howard and Maria Duggan, the new PO for Loch Swilly Graham Wilkinson and his wife Louise, Michael McKee and Carol McAuley, former RRC Ireland and PO for Dublin John Bourke and wife Margaret, Terry Johnson and Diana Connolly, Michael McLaughlin and Brigit Cullen, Michael and Phyllis Boyd, Jarlath Cunnane - twice winner of the Barton Cup and recipient of the Vasey Vase, George Coyle, Peter Owens, John Coyne, Richard and Eilish Wilie, Michael and Ann Craughwell, Enda Connelan and Brenda Daly, and Derek Joyce and Dairine Sheridan. As OCC Rear Commodore, Daria Blackwell addressed the gathering with a short overview of OCC's very healthy status in the sailing community. The OCC is among the few organisations that are growing year over year, now with almost 2900 members representing 48 countries, making ours the most international sailing club in the world. She shared the adventures of Cian Mullee, the local sailing club Youth Sponsorship Programme participant, who went off to cross an ocean with a member and was asked to cross two more, creating the adventure of a lifetime. She also talked about the Mentoring Programme which is not just for Associates but for anyone who wants to connect with someone who has already completed a similar adventure to one being planned. As Port Officers for the OCC in Clew Bay, Alex and Daria Blackwell are always keen to welcome OCC members whether by land or by sea. It was a great evening with new friendships forged and past connections rekindled. People left asking to have the event repeated annually. Alex canvassed the group about rotating the event around the country and received unanimous consent. Next year, it looks like Cork, in advance of the 300th Anniversary of the Royal Cork Yacht Club in 2020. It will give us a chance to plan how we can all take part in the party.